Audi said it has conducted thousands of miles of self-driving car research already in Europe and various U.S. states where testing is currently permitted. Audi and Mercedes-Benz have received licenses for self-driving cars in California after new laws governing autonomous driving went into effect on Tuesday. Previously, automakers and Google were allowed to test self-driving vehicles without a license. California is important to Audi because the state is also home to its Electronics Research Lab. Audi says its engineers at the ERL are working on a range of autonomous driving issues, including whether the human or the car is, or should be, handling driving functions. At Pikes Peak, the company sent an autonomous TTS up the hill, completing the 12.42-mile route in 27 minutes. Mercedes said its engineers will "teach" the autonomous cars how to operate safely on U.S. roads using different methods than are used in the testing and development of the cars in Germany. Mercedes said its test drivers "must recognize clearly when the car is in autonomous driving mode and must be able to override this mode at any time; in addition, the car must be capable of stopping autonomously at any time." The new California regulations state that a company must have insurance worth at least $5 million to test on the state’s roads. That’s per car -- not total. Toyota, Ford, General Motors and others also are testing autonomous cars. An IHS Automotive study says that by 2025, there could be as many as 230,000 self-driving cars hitting the roads per year. 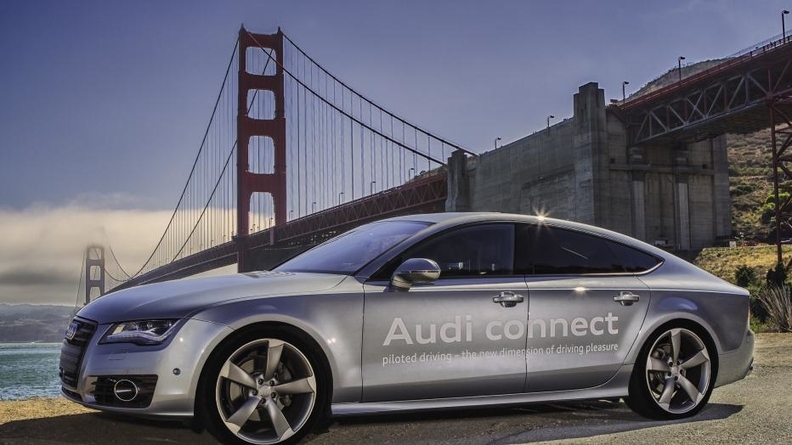 Audi was also granted a permit in Nevada, as well as for testing on Florida’s “connected car” expressway. In a statement Tuesday, Audi said it has conducted thousands of miles of self-driving car research already in Europe and various U.S. states where testing is currently permitted. A freeway in Tampa, Florida, was named a connected car throughway in 2012, the statement said.